The area qualifiers for the festival have now been confirmed for the 17th of July. The venue has yet to be confirmed. Training will be divided into 2 parts. U12's will be trained by the wonderful Gemma Ferrer and dates have been confirmed and are soon available for booking on itsplainsailing. Last year we had great interest and a fabulous festival with all of the younger members really improving their show jumping skills. Dates are the 18th of June, during camp, 25th of June, 9th of July. It is important for kids who wish to be selected for teams to try attend a minimum of 2 training sessions to allow the selectors to pick fair teams and to give all members the best opportunities. Our Robbie Bailey and Jon Ledingham hopefuls will train together under the guidance of Marc Davern, dates for this 27th of June and 4th and 11th of July. The rules for entry are slightly changed this year. It is very important that all members and their parents are familiar with the rule book particularly re eligibility to jump. The rule book is attached here and is also available on the Irish Pony Club website. Please look at the timetable below and ensure that you are available for your chosen discipline. Of course members not participating at competition can do training but must make it clear if they are not intending to travel to the festival. Thursday 26th July: U-10 and U-12 Combined Training and the U-10 Mounted Games. Friday 27th July: Pure Dressage Team and Individual, Junior, Novice, Intermediate, Open and Senior Associate Combined Training, U12 Show Jumping (Alice Mernagh), Musical Ride and Junior Mounted Games. Saturday 28th July: U-14 Show Jumping (Robbie Bailey), Intermediate Show Jumping (John Ledingham), Senior Team, Senior Individual, Senior Area Team Show Jumping and Senior B Mounted Games. Start times will be published on the IPC website and e-mailed to DC’s when they have been confirmed. A huge Congrats from all at Tipperary Hunt Pony Club to Lucy who got her B+ pony test in Gurteen Ag College on Sat 23rd of March. C+ training and testing will be held towards the end of aug. start of sept.
Big congratulations to all of the members who passed the C test Saturday the 30th of March. A big thank you to our trainer and parents for their hard work too. Games Training will recommence this year on Thursday the 18th April 2019 at O’Reilly’s in Ballypatrick at six o’clock. First timers interested in trying out pony games are very welcome. Contact Deirdre O'Reilly if you have any questions. The schedule for the 2019 minimus training is now available. For more information on minimus please click on the minimus tab. The Hunter Trial Championships are taking place on Saturday April 27th. In preparation for this there is training organised on the 18th of April. Please sign up on itsplainsailing page. ​​ Hunter trials happening all around the country in the coming weeks. The following is a list of ODE qualifiers so mark them into your diaries nice and early. The Waterford Hunt branch will host their annual Inter-Branch Team Showjumping on Good Friday 19th April 2019 Ballinamona Equestrian Centre, Old Tramore Road, Waterford. Start: 9.30am sharp. Teams of 4. Anyone who would like to form a team can do so or forward your name to the committee and we can join up members to make teams. Please include height competition that suits your child best. Full details on the flyer below. This is an ideal warm up for the upcoming festival qualifiers. Well done to all who competed in the Eventing Championships. Great results and team work from all of our members. A lovely way to finish off the eventing season. Full results are available on the IPC website. Grove 2018 results see above. Thanks to all our volunteers who made a very large entry event run off very successfully. but because they are priceless!!! THANK YOU. ​Another great camp draws to an end. What a week. The sun was shining, the juice and biscuits were plentiful and the ponies were on fire.... Some photos of the week say it all. Thanks to all who made this week run so smoothly. There are so many people who volunteer their time to make it all happen so thank you to each and everyone who contributed in any way. Every bit helps. There was a great turnout by the Tipps at the area 3qualifier. We had three teams through to the John Ledingham (1m), two teams qualified for Robbie Bailey(90cm) and two teams for Alice Mernagh (75cms). We also members qualify for Combined training intermediate, novice, junior, U12 and U10. The qualifiers took place on Tuesday 17th July at Roscrea equestrian centre. A geat day was had by all and there was some great jumping of some very tricky courses and some lovely tests. We were in a great place heading to Barnadown for the IPC Championships. We had some really great competitors this year....they really went for it in all diciplines. All results are on IPC website. A big shout out to all who organised training in the lead up to the competition and to the trainers who supported all of our teams so well at showjumping, at combined training and during games over the three days. Some great shos of our prize winners, competitors, coaches and parents below. Well done to all our minimus competitors. All your hard work and training over the last number of weeks certainly paid off. You all improved so much. Many personal goals were achieved over the minimus championship weekend and you all did the club proud. Some pictures from the recent showjumping clinics held at Bluegate stud with Louise Lyons as a start of preparations for the championships. Members intending entering Alice Mernagh, Robbie Bailey and John Leddingham all took part in the clinics and great promise was shown by all participants. Further training is planned once mimimus is complete so watch this space and if anyone has anymore photos send them to whatsapp page please. Some photos of Waterford county fair where the tipperary games teams had another great day. The Junior Team came sixth, they put on a great performance however luck was not on their side on the day. We had two U10’s teams - the Tipperary Spots Team w came a brilliant second place beaten by the Island Branch by just two points and the Tipperary Stars team - the picture says it all - total stars -they played like pros and came 6th in a very competitive competition. It was the first competition for most of the U10 Tipperary players so a bright future for games ahead. 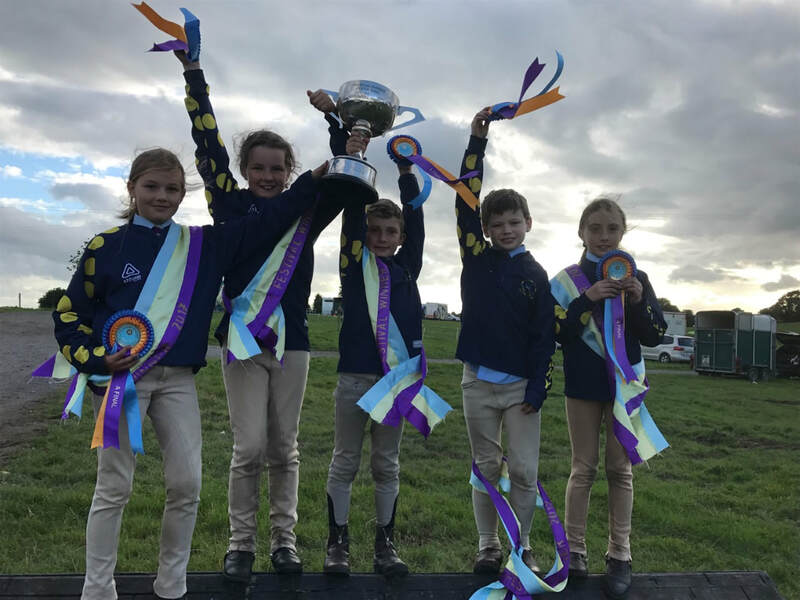 Team members Emily Fox, Lily O’Reilly, Max O’Reilly, Anna O’Callaghan and Alice Everard competed in Shrewsbury representing both The Tipperary Hunt Pony Club and Ireland in a very exciting and competitive pony games competition consisting of 18 Junior Teams. The competition ran over two days with two heats on Sunday and one heat on Monday morning followed by an A, B and a C Final. Tipperary were in third position after the first day of competition. After a very competitive heat on Monday morning and all points over the two days added up this Tipperary team qualified for the Junior A Final. Tipperary finished in 2nd place in the A Final much to everyones delight. Thank you to all the sponsors who ensured that both riders and ponies looked their best and were well fed over the weekend. The sponsorship included team jackets from David and Sharon Lynch of Premier Autos with embroidery by Custom Embroidery , green jerseys from AQS Environmental Solutions, rugs, numnahs, head collars and ropes The Equine Warehouse, feed and haylage from Star Fuels, monetary donation Clonmel Oil and treats for all from O' Donnells crisps. Congratulations to Deirdre our new DC. Joan Fox will remain on the committee as assistant to Deirdre. Thank you to all members for your consistent efforts in organising and supporting the work at committee level. We hope that members and parents will continue to be positive and supportive of the work that the committee do to run a successful Tipp HPC. Details of club gear currently available to buy appears on itsplainsailing. Hoodies, softshell jackets and xc colours currently up for ordering. Mon 1st to Fri 5th of July 2019 inclusive. Now available to book on itsplainsailing. vaccination requirements for all ponies/horses. (2)A First Booster must be given 5-7 months (not less than 150 days and not more than 215 days) after the second injection of the Primary Course. (4) Vaccination within 7 days prior to entering the Stables is NOT ACCEPTABLE FOR ANY vaccination. (5) If at any time an injection is given later than is required under these rules, the whole sequence must be started from the beginning, including the 5-7 month booster. If there is any issue receiving texts or accessing the online system please let Joan Fox or any committee member know asap. We will do our best to resolve any issue for you. you to wear your club colors with pride. Club colors are navy cover cap with yellow dots and navy xc jumper with writing on sleeves. Available to purchase @ Equine Warehouse, Clonmel. Keep sending us your fun photos from being out and about at your pony club activities. Its lovely to see you participating so early in the year. Send your pictures via whatsapp to Jackie Barden or any committee member. Include the date/event name and your approval to publish participants names. Tetrathlon Training 2019: All budding athletes keep fit with your peers this summer and have some fun Shooting, swimming, riding & running. Contact Sophie Wall on 086 8790062 or Declan Murphy . Remember to take part in any pony club activity you must have your membership paid & please use the online booking system as instructors venues times etc have to be booked in advance! It is now a legal requirement that all equine premises in which a horse is kept must be registered with the Department Of Agriculture. Registration is free. Please see the Department Of Agriculture website for more details.